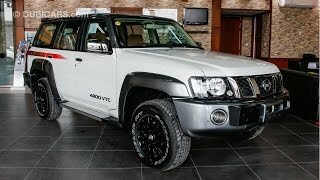 New 2019 Nissan Patrol Super Safari for sale in Abu Dhabi with finance options. Available from Motor World Showroom with warranty. Automatic transmission, 6 cylinders, 17″ wheels and tan interior. This Nissan is GCC specification and seats 7 people. Be sure to check out our video of this Nissan Patrol Super Safari above! See all new Nissan Patrol Super Safari for sale in Abu Dhabi.